Bricklink's AFOL Designer Program finalists have been selected and are now available for pre-order. Sets meeting sales goal would be produced and shipped out by May 2019. Being a castle/historical builds fan I was so happy to see a castle set, the Löwenstein Castle, being on the list! The castle looks fantastic to me. The price is a little steep, but as of this writing is already 47% funded, so chance of it becoming a reality is extremely high. so are we charged pay only if it's shipped? also it would be nice to get something special and unique as an original backer. also the price seems inflated...is there a premium on these sets? Yup, if it's fully funded they'll charge you after April. Agreed, having something unique as original backer would be awesome. I wonder what kind of packaging would be used. Price is just around 10 cents a piece, not sure if that's what BL went by when they established costs. USA buyers get free shipping. Outside USA may require additional fees. Definitely my favorite of all of them as well. I'm surprised by the price, but then again, given the RRP of something like Kingdoms Joust and the number of pieces I guess it makes sense, especially given the nature of this project and the general trend of LEGO RRP as well. An hour after OP and its 74% funded, so I'm pretty sure it will make it. 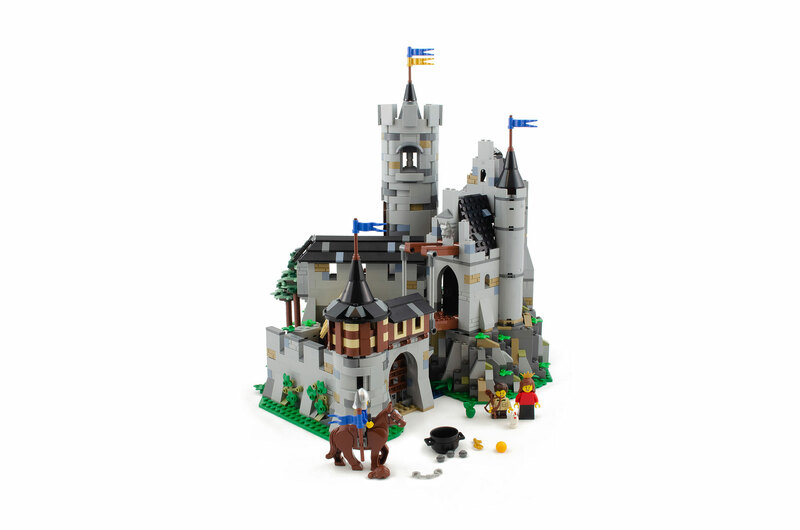 I hope that its successful and inspires LEGO to bring back a classic castle theme again! This is beautiful (I'm in). Regarding some that are saying that the price seems high. The pieces seem larger than the typical new LEGO sets (this looks a bit more old school). 2000 pieces for this assortment of pieces seems like a really nice set. The way I look at it is that it would cost a lot more than $200 if I were to buy all the pieces from elsewhere. Given Lego Castle theme is no more, this would be a good parts pack for MOCs too. I've been studying the pictures, and basically all the features that one (at least I) would want in a castle is there. Lift gate, checked; draw bridge, checked; interior details, checked; interesting angles, checked; well, checked; dungeon/underground area, checked; animal area, checked; trees, checked; elevated base, checked; wooden structure on top of stone, checked; towers, checked. I'm pretty excited about this release. Don't worry Lego is releasing one later this year! I’m interested in what the packaging looks like in the final shipped version. Fair point. I'll fully admit that my estimated price points were mostly just based on wishful thinking. And don't let my minor complaint above confuse anyone, I have happily handed Bricklink my payment info! Is anyone else surprised by the relatively low # of pre-orders required for a set to be funded? Based on Ideas as well as the amount of time that pre-orders are open, I'm shocked that a lot of these need less than 100 backers. My (VERY ARBITRARY) guess was not nearly as high as Ideas but a lot higher than this. No complaints, as of now, as long as 1 more person backs this before April, it will be funded! Bam! 101% funded as of now. It''ll be a long wait till May but it'll be worth it! Please make nice box art to go with it! What's with only being able to order 3? Could it possibly be to avoid reseller scums?? Lol. Kind of a weird question, but will this be a full-blown production with a nice instruction book and box, or much smaller level with cheap instructions and a plain brown cardboard box? I have no idea how they could even produce nice instructions and a nice box at this price point with relatively few buyers. Has Bricklink been doing something like this for awhile? It's a great idea and I'm buying one regardless. No, this is new. BL rolled out Studio 2, a new lego design tool a few months back. It is pretty fantastic and easy to use. BL partnered with Lego and had competition to vote on the best studio 2 submitted designs and then see if they could be crowd funded. Some pretty strict design restrictions about no licensed content and brick #s below UCS levels, generic mini figures, etc. I really like some of the designs and think expanding the parameters if there is a new competition could really give designers more creative control. Obviously can’t have people throwing around Disney branded products, but using Lego brands Ninjago, Elves, pirates, classic space, etc. would be great. Is Lego packaging this or Bricklink? The price is steep but for a custom set its cheap unless Lego is helping with the parts cost. It sounds like the box would have some sort of design but who knows. If the packaging is nice (and includes Lego branding) and it's a "limited edition" then it will skyrocket on the secondary market. Shame Lego won't produce something like this under the Ideas banner though. BL will be packaging these, not Lego. Think of it more like a Certified Professional set. There may be a Lego logo somewhere on the box since they are actively supporting the project, but it won't look like a regular retail set. The difference between this and Ideas is scale. Lego's production lines are set up to make 10's of 1000's of the same set. These will only be made in a few hundred copies. So it's likely more cost effective to hand-pack them, than to shut down a large production line, change over the setup, and only run a tiny batch and change over again. I really like the idea of 'small batch designs' to broaden what's available to AFOLs to build. I've been creating custom sets for a while, and its a tremendous amount of work. I hope the program succeeds and we get annual waves of new designs. I’m somewhat skeptical of MOCs. I love the ideas and creativity, but then you get into issues like testing and playability. Things that Lego does extensively that don’t necessarily translate all that well. I think these are solid display sets, but I’d wait a bit to hear some reviews on function and features before dropping this amount of money on a set. Regardless, this is a huge leap for BL and a nice shift for Lego. I am sure that if there is any issue with the sets that they can come together and deal with it. With all the talk about CPC on Amazon, I wonder if BL did testing or simply doesn’t have to since they are crowd sourcing. Not sure what that means for secondary resale markets on these, like Amazon. But I think these are by definition designed for AFOL and the playability factor is not as important. Havin said that, the judges did have to build it from the ground up so I’m sure stability is taken into account when scoring the entries. I have seen enough MOCs to recognize the similar feel to this one here yet the design could nicely enough be released as an official LEGO product. The price for what all you get is not too bad considering there have been significantly smaller custom kits available through various fan sites costing more than it would be to acquire everything separately and then some (such as a near two hundred piece vehicle listed at roughly $60). Typically rules limit creativity; however in many cases working within limitations can help bring out the best for a finely focused feature like this fort. The build is nice to look at while "generic" enough to fit with our own medieval monuments and possibly fun to play around having every area filled with fitting details over needlessly fancy fluff. Though the AFOL Designer Program may be in its infancy, the fan community (not to mention the selling platform of Bricklink) is far and well away from. Also the program could help elevate Bricklink into being more than simply a site to buy parts from. I have high hopes and support this project with every fiber of my being. There has been a lot of chatter on the BL page for this build the past 4 days, which included input from the original creator, Raziel_Regulus. 1. Approximate costs for EU buyers (including customs and taxes) up to 250€. 2. Raziel is "playing with the idea to design a second building 'completing' the model on the back side, which would contain the chapel among else." Hopefully at some point he will provide instructions for the MOC.